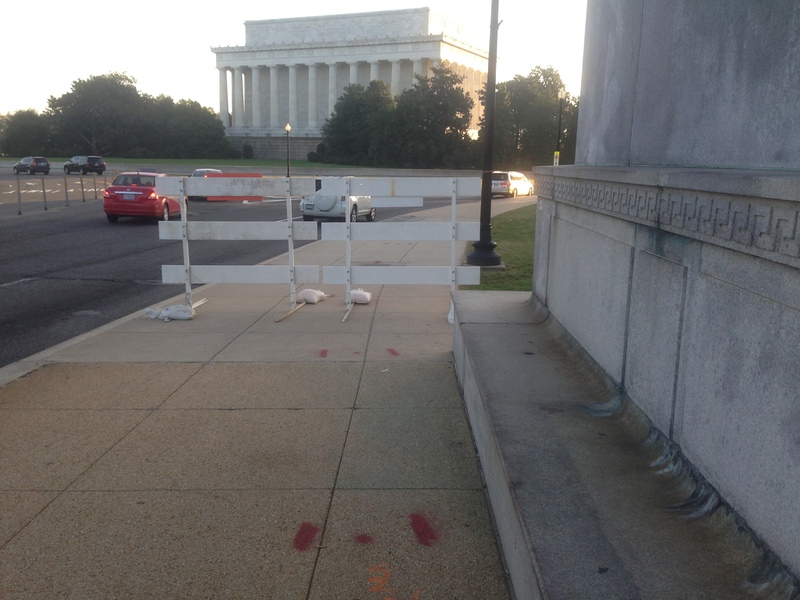 Sidewalk Closures on the Memorial Bridge – Lindsey Bikes! Riders on the eastbound side Memorial Bridge were met with an unfriendly sight this morning. A sign blocked the entire walkway and forced people into the grassy area on the side of the bridge. Earlier this year the decision was made to close parts of the travel lanes and parts of the sidewalk to begin work on the several degraded bridge but work has not yet begun. There was no timeline available for the work as of Tuesday morning. No announcements had been made and no provisions put in place for cyclists and pedestrians looking to access the eastbound of the bridge. The sidewalk is certainly in need of work. The pavement is very degraded, in some spots there are temporary wooden bridges spanning gaps in the cement. There are areas with missing railings, and orange cones and caution tape have been a permanent fixture here for quite some time. The work needs to be done, there’s no question about it. Note: I don’t know what work is scheduled to be done – it may very well be only structural at this time. We do know the bridge has major structural deficiencies and will need A LOT of work, so these closures could become more regular as work continues. The major issue with the work schedule is the impact it will have on pedestrians and cyclists. At this time there is only one way to access the Memorial Bridge from the Mount Vernon Trail. To access the MVT one must cross the G.W. Parkway. The only legal crossing is located on the eastbound side of the bridge. 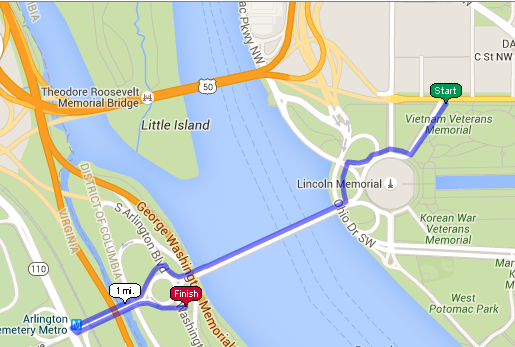 There is also no direct access from the National Mall to the westbound side of the bridge. One would need to cross several interchanges and detour a significant distance to access that side. For tourists and those unfamiliar with the options this could be very confusing, especially if no signage was posted to explain how to cross (no signs were posted Wednesday morning). How can we safely accommodate cyclists and pedestrians? Block off the currently (partially) closed right lane on the eastbound side and turn it into a sidewalk. The lane is already partially closed to motor traffic and a full closure would have a limited impact on drivers. It would provide the most accommodation in the safest way possible and be the most accessible to the greatest number of people. Temporary crosswalks could also be installed at either end of the bridge. The are no curb cuts on either side but temporary ramps could be added. The curbs here are quite high so without curb cuts this solution would be unworkable for a good number of people, including cyclists. This is the less safe solution as people would need to cross six or seven lanes of fast moving traffic without any refuges to stop at. Join WABA and then call them up and ask them to advocate for safe alternatives during the closure. Call NPS as they control the bridge and have scheduled the closures. Call Park Police and ask them to enforce drivers yielding at the crosswalks. Call up the local news. Call your Congressional representatives and tell them how the closures will impact you. Tweet about it. Post it on Facebook. Share this information with your friends, family, colleagues, and acquaintances. Make your voice heard. These closures are absolutely necessary to make the much needed repairs to the sidewalk, but NPS needs to provide safe and equitable accommodations to the thousands of people who use them each day.